Modern Monogram are a huge thing to have and absolutely gorgeous! They can be done just the way you want them.Â Check this out and get started so that you can monogram all by yourself! Monograms are everywhere and quite gorgeous.Â People even put monograms on the backs of their vehicles!Â Personally, I’m not into monograms on my vehicle but it may be my frugality at play.Â Come to think of it, I don’t have anything that’s monogrammed.Â For that exact reason! Now, that being said, I have plenty of things that are absolutely gorgeous and didn’t cost additional money.Â This is because I’m willing to DIY or do any handcrafts that I can!Â There’s something special about being able to make thing rather than buy them, in my opinion. I’d love to have an embroidery machine, I’ve wanted one for a very long time.Â Unfortunately that just doesn’t seem to be in the cards at the moment.Â SO you can see why I am excited about this book and kit! For those of you out there, who love Pinterest and YouTube tutorials I can say this: yes, you could probably learn all of this for free from those sources.Â However, we all know we spend way too much time staring at screens and it’s absolutely not the same as having the books to hold in your hand, flip through, and share with those who want to learn too! 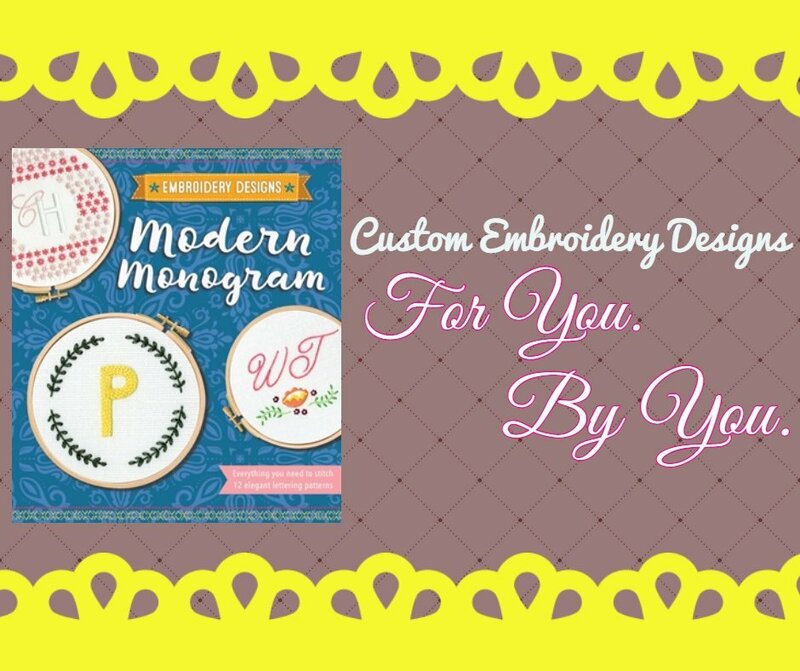 Modern Monogram comes equipped with everything you need to stitch 12 elegant lettering patterns.Â You can mix and match the designs to your preference very easily and make an embroidery patch for anything you’d like! 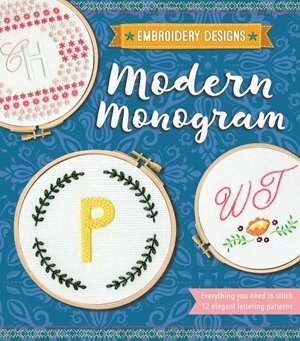 Modern Monogram teaches anyone, from a complete beginner and beyond.Â I’ve been doing embroidery and cross stitch since I was a child and I’m learning new stitches from this little book! There are 12 different stitches that you can learn, some basic such as the straight or cross stitch, while others are a little fancier including the detached chain stitch, French knot, or the granitos stitch. This little book of Modern Monograms teaches us 12 different monograms!Â Utilizing the iron on transfer (which is included) author Kelly Fletcher takes us through, giving the colors of thread used in the photo (also included) and which stitches to use. While it is not really a focus on the Modern Monogram book description and such, I love that the entire thing comes in a sturdy, foldable little box that can easily travel with you!Â It opes up to a little envelope keeping the book from falling out and another folded box to hold everything you need! Having taken my craft projects along on a lot of trips, I can say this is especially great!Â There’s no need to take a whole sewing bag as you can fit enough projects in the little box to keep yourself quite busy on both long trips and short trips!Â It even fits perfectly in your purse! As stated previously, I don’t like spending money.Â Not if I can make it myself in any way.Â So, my ‘cheat’ for this book is that will be making copies of the iron on transfer so that after they are all used up, I can still have the template to make more! Simply make a copy then when you need to use it, trace the pattern onto your fabric.Â Light boxes are inexpensive and perfect for this application!Â Or, if you aren’t ready to buy one, simply tape your paper onto your fabric and trace it with a fabric pen or pencil. 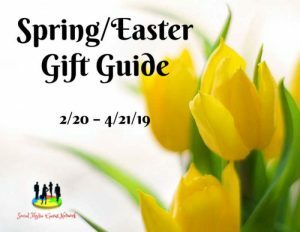 This awesome book, Modern Monogram, is part of our fantastic Easter/Spring Gift Guide!Â Check it out today! I would love this book. I miss embroidery and cross stitching. This book looks like so much fun! I would love to try to pick this up as a new hobby. This looks like a very useful book! I used to cross stitch as a child. I haven’t in ages though!